Are you celebrating Diwali this year? I am. 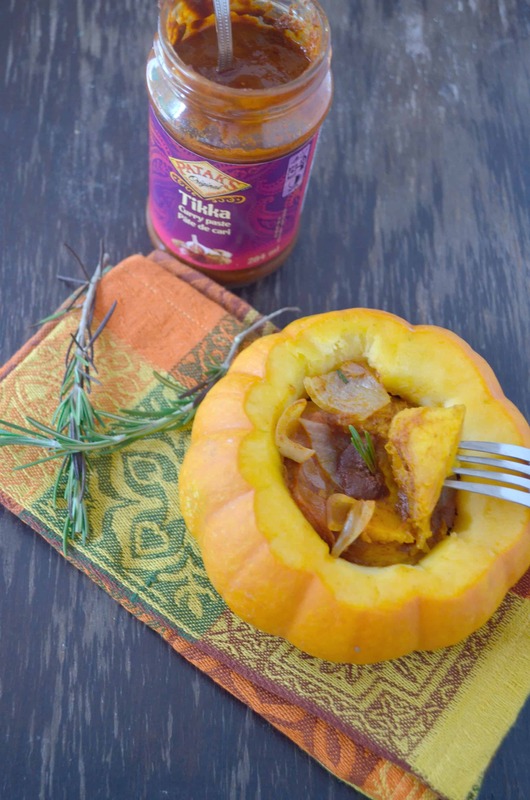 I am celebrating this equivalent of Christmas with a delicious Diwali Recipe: A curried roasted pumpkin served in a pumpkin bowl. We can all use some celebration in our days: between work, family commitments, we tend to forget to sit down and enjoy ourselves. Celebrations are here to remind us to do that: remind us to enjoy a delicious meal with our families. I like the Diwali celebration as it is associated with themes of light conquering darkness and sharing with friends and family. The focus of this holiday is on traditional Indian vegetarian dishes: that’s why I went with a roasted vegetable dish. and since I am a huge fan of curry, I added curry to my dish. Let me share with you my Diwali Recipe. You will love every bite of it. Wash the pumpkin and dry it. Cut off the guts until you have a nice clean surface. Then scrape as much as you can. Dry inside off with a towel. Wash your second pumpkin. Make few holes with a fork. Add pumpkin and cover. Let it cook for 10 to 15 minutes or until pumpkin is tender. Make sure to stir occasionally. If needed, add some water. The tomatoes will release their water so you won’t necessarily need to add. Serve in your pumpkin bowl. You can serve this curried pumpkin roast with rice or naan bread. Since I wanted to celebrate Diwali, I wanted a fancier way to serve this Indian dish. Your serving bowl can be used later for another roasted pumpkin recipe. (This is what I did). It was the first time I cooked an Indian dish. I loved every bite of it. It was spicy but not too spicy. It had an awesome flavor. And most of all, I enjoyed preparing and eating a Diwali recipe with my family: after all, Indian or not, we can all use some Indian food in our lives to spice it up. From now through October 30th, Patak wants to help you Share the Light with your friends and family. Simply tweet #ShareTheLight along with your friend’s @name to @PataksCanada and they will whip up a little something special for them! Patak’s has also launched a new Tumblr with more delicious recipes and inspiring messages. Don’t miss Patak’s Pinterest page, it’s filled with tasty treats! 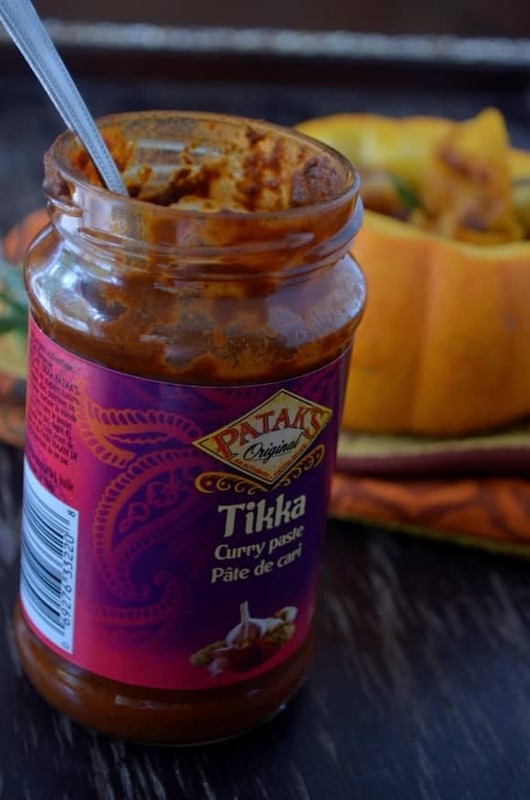 Disclosure: I am part of the Patak’s Canada ambassador program and I receive special perks as part of my affiliation with this group. The opinions on this blog are my own. Fill Those Easter Baskets with Cute DIY Treats! Am I an Over Protective mother? Am I Old Fashioned? This sounds so good! I love curry but have never used a pre-prepared sauce! Looks delicious! This is beautiful, I like it a lot. Sharing on twitter and Pinterest. Have a great night! That looks amazing! Hope you had a great Diwali. That is so up my alley! I love pumpkin to the moon and back! This pumpkin roast sure does look good. I have never eaten Indian food, but I’d try this. My hubby loves curry – I will give this a try – great change from the norm. I actually have this in my pantry and did not know what to do with it! I really love this idea! Thank you! I would have never tried curry with pumpkin. Looks so yum! OK I love curry and have plans on actually making me a curry chicken dish today. I’ll love to try that product. Yes! I loooove Indian food – and it’s not something you see often on mom-blogs. Thanks for the recipe, will definitely have to try it. I am not familiar with th Diwali holiday. This dish looks and dounds interesting and worth trying. I can honestly say that I have never purchased curry paste. Thank you for the recipe, now i know what to make with it. Sounds delicious! I’ll try this curry recipe for next Diwali. I’m crazy about the taste of curry. I absolutely can’t wait to try this! Oh wow, what a unique dish. I have never heard of curried pumpkin before, but I love trying new dishes. I like pumpkin curry, but never had it like this. This sounds interesting and very fitting for the fall season! I’d love to give it a try, thanks for sharing the recipe! Oh my goodness, how did you ever come up with this. I love how it is literally inside the pumpkin. HA! This recipe looks really good, it reminds me of another recipe by a friend that I tried at one of her parties. She mixed her pumpkin with chick peas and Spanish spices. It was really good, her dish opened up my interest in pumpkin. This sounds really good and healthy too! Love pumpkin! This looks so deleicous! I love curry! and I LOVE pumpkin! I’d love to try this with my family. I love curry. It’s such a flavorful spice I bet it comingles really nicely with pumpkin! And, I love how you serve it in a pumpkin too! Curry and pumpkin? Yum! This sounds like something my husband would absolutely love. 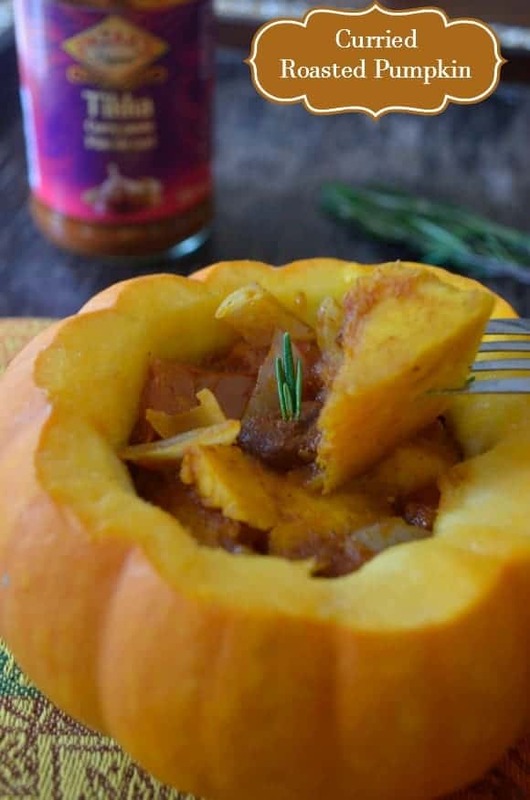 I have roasted other squash but never have pumpkin, this looks like the perfect fall recipe. This sounds soo good! I love pumpkin and curry both and I bet they go very well together! Wow, this looks delicious! I love it when you are able to put meals in a fruit like that. It makes it so much fun to eat. This sounds delicious. The beauty of pumpkin is that it’s great for both savory and sweet dishes. That sounds really good. I have definitely never had anything like that before. Sounds yummy. I do love curry. I have never thought of it with pumpkin. It is a great combination. We love curry, I would be interested to try this and see how it tastes. Let me know if you do. Curry spice and pumpkin are a match made in heaven.I will love this I am sure because I love both and this looks sublime. Dollar stores – Are they good to shop from?